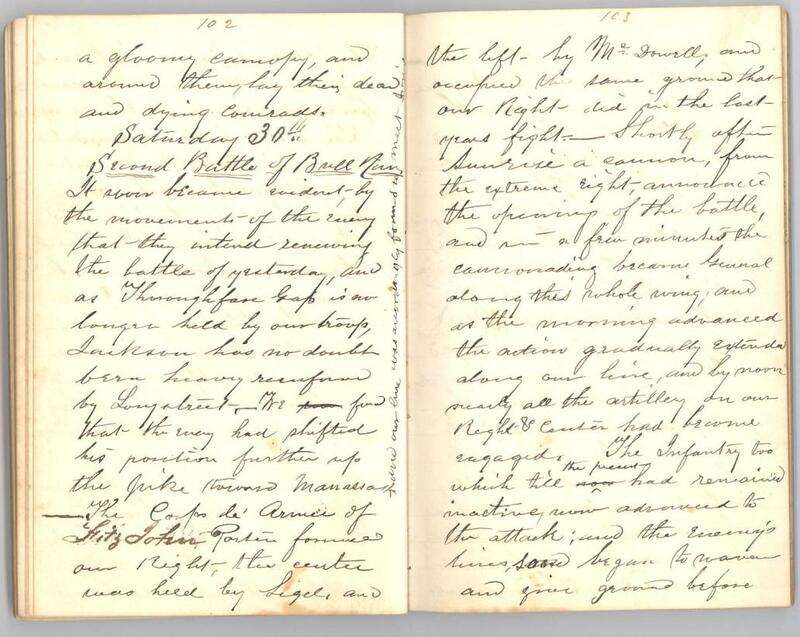 Item description: Entry, dated 29 August 1862, from the diary of William Penn Lloyd (1837-1911) of Lisbon, Pa., 1st Lieutenant, A.A.G., First Regiment Pennsylvania Reserve Calvary during the Civil War. 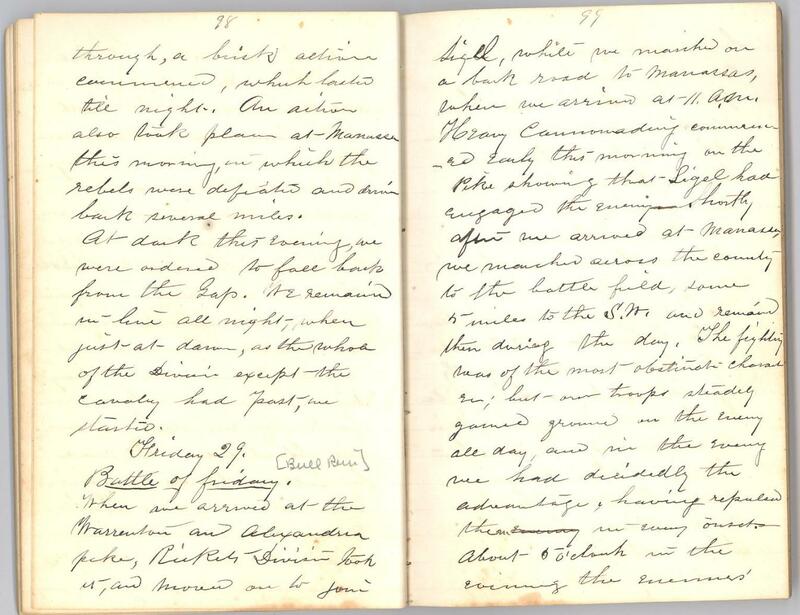 In this entry, Lloyd reports on his involvement in the Second Battle of Bull Run (Second Battle of Manassas), fought in Prince William County, Va., 28-30 August 1862. When we arrived at the Warrenton and Alexandria pike, Rickets Division took it, and moved on to join Sigel, while we marched on a back road to Manassas, when we arrived at 11 a.m. Heavy cannonading commenced early this morning on the pike showing that Sigel had engaged the enemy. Shortly after we arrived at Manassas, we marched across the county to the battle field, same 5 miles to the S.W. and remained there during the day. The fighting was of the most obstinate character; but our troops steadily gained ground on the enemy all day, and in the enemy we had decidedly the advantage, having repulsed them in every onset. About 5 o’clock in the evening the enemies lines gave way and our cavalry being ordered forward, dashed on their flank and rear, and drove them back to the reserve[?]. The fighting of to-day was as usual of the most obstinate character, and too much can not be said in praise of the bravery displayed by our troops, the boldness and courage of the enemy, too, is worthy of a better cause. They fight with a desperation akin to madness, and as often to-day as their columns were shattered, broken and driven back by the galling fire of our infantry and artillery, they rallied, and with rank refilled, with new men, came forward again to the struggle. The battle field extended about 3 miles along the Warrenton and Alexandria pike, our forces holding the pike, and the rebels a line S.W. toward the mountains. The sable garb of night settled down on the field of blood, and the weary warriors. after a scanty supper of coffee and crackers, lay down on the ground upon which they had fought, and were soon locked in the arms of sleep. Above them, the smoke of battle, which hung in dark masses over the field, formed a gloomy canopy, and around them, lay their dead and dying comrades. 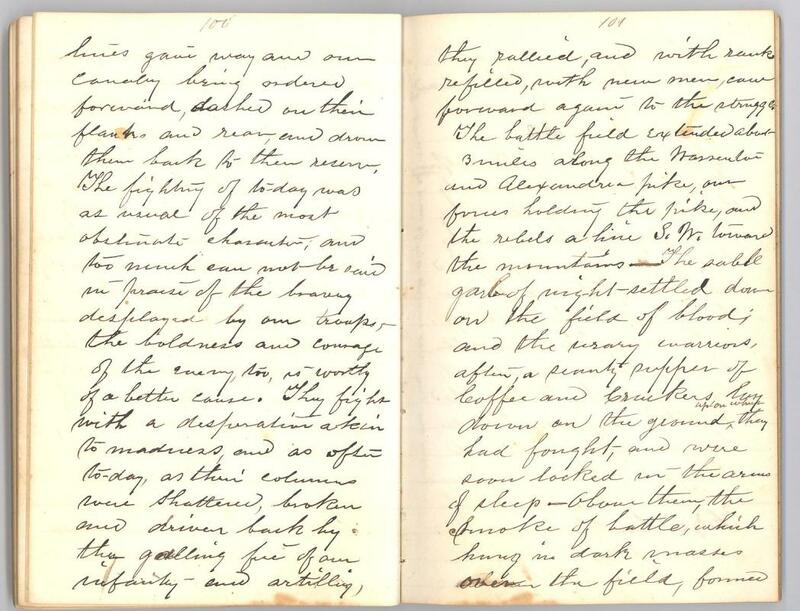 This entry was posted in Southern Historical Collection and tagged 1st Pennsylvania Reserve Cavalry, diaries, Pennsylvania, Prince William County, Second Battle of Bull Run, Second Battle of Manassas, Virginia. Bookmark the permalink.